The Seminole Tribe of Florida is a federally recognized Seminole tribe based in the U.S. state of Florida. Together with the Seminole Nation of Oklahoma and the Miccosukee Tribe of Indians of Florida, it is one of three federally recognized Seminole entities. It received that status in 1957; today it has six Indian reservations in Florida. In 1975, the Tribe established tax-free smoke shops and a high-stakes bingo operation that became one of the first tribal gaming endeavors in the United States. These ventures, particularly the gaming operation, have generated significant revenues for education, welfare and economic development. A 2005 tribal audit said it took in $1.1 billion in revenues that year. The tribe requires members to have at least one-quarter Seminole blood quantum. The Seminole emerged in a process of ethnogenesis from various Native American groups who settled in Florida in the 18th century, most significantly Creeks from what is now northern Florida, Georgia and Alabama. These settlers distanced themselves increasingly from other Creek groups, and expanded and prospered owing to their thriving trade network during Florida's British and second Spanish periods (c. 1767–1821). During this period, they developed alliances with African-American maroons, mostly self-emancipated former slaves from the South's Low Country and some free blacks from the Spanish period of rule. These people became known as Black Seminoles, establishing towns near Indian settlements. During the Seminole Wars against the United States in the 19th century, however, particularly after the second war, most Seminole and Black Seminole were forced by the US to relocate west of the Mississippi River to Indian Territory. A smaller group – possibly fewer than 500 – refused to leave Florida and moved deep into the Everglades, where they avoided settlers and thrived in pseudo isolation. They fostered a culture of staunch independence. The modern Florida Seminole, about 17,233 at the 2010 census, Miccosukee and Traditionals descend from these survivors. The Florida Seminole re-established limited relations with the United States and Florida governments in the late 19th century, and by the early 20th century were concentrated in five camps in the Everglades. The portion who spoke more Muskogee consolidated in the northern part of the Everglades near the Cow Creek Camp, becoming known as the Cow Creek Seminole. 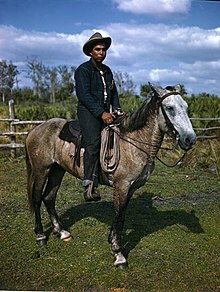 The Miccosukee, who spoke the Mikasuki language, were located to the south, in an area cut through by completion of the Tamiami Trail in 1928. The Cow Creek Seminole eventually received 5,000 acres (20 km2) of reservation land in the 1930s, beginning with Brighton Reservation. At first, few Seminoles had any interest in relocating to reservations, preferring their traditional lifestyle to a more sedentary reservation life. Following the efforts of Creek Christian missionaries, more Seminole moved to reservations in the 1940s to form their own churches. Other factors in the move include Florida's drainage of the wetlands and shift toward wide-scale agriculture. This contributed to the depletion of game and other resources by the state's expanding population, reducing the tribal people's ability to live in traditional ways. During the 1920–1940 period many changes took place in the habitat which the Seminole had lived. Settlers and developers wanting to convert wetlands to farms and residential communities had built drainage projects, which altered the wetlands ecosystem and damaged many species that it supported. As early as 1916, Royal Palm State Park, which would be incorporated into the Everglades National Park in 1947, was set aside as a conservation area. Construction of the Tamiami Trail across the center of the Everglades, the Civilian Conservation Corps projects from 1933 to 1934, and the eventual opening of the National Park, all served to displace many Seminole families who had lived throughout the area. In the 1930s, the US government established a reservation at Brighton and tried to recruit Seminole to resettle there. The government fenced in the reservation and introduced cattle, which had been part of Seminole culture for three centuries. The first government shipment of cattle arrived from Arizona in 1934 and, by the late 1930s, the cattle business was a way of life for many Seminole. With the introduction of cattle to Brighton, the Seminoles were introduced to democratic ideas and tribal organization. The trust agreement established by the Commissioner of Indian Affairs, on 12 September 1939, required that the tribe elect three trustees to transact the business of the cattle program. The first "election" was largely guided by the Florida Agricultural Extension Agent, Fred Montsdeoca, and a local missionary. They promoted men who knew English and were good at white-Indian cooperation, as opposed to allowing the tribe to select those most skilled in animal husbandry. Montsdeoca was extremely influential in making decisions regarding the cattle program and, next to the Indian Affairs official at the reservation, was the most important local white man for the Seminole. Given their success at Brighton, in 1941, the Seminole acquired 150 head of cattle from Florida for the Big Cypress Reservation. By 1944, the Big Cypress Seminole wanted their own trustees and drafted an agreement with the government. Approved by the Commissioner of BIA on 8 August 1945, this agreement called for the establishment of the Brighton Agricultural and Livestock Enterprise and the Big Cypress Agricultural and Livestock Enterprise, each with their own 3-trustee cattle managers. It said that the tribal trustees would be appointed, with each of the cattle trustee groups and the BIA agent to appoint a tribal trustee. The three appointees on each reservation would also serve as tribal representatives. In essence, this requirement ensured that those adept at navigating between the Indian and white worlds would gain the positions. According to Covington, men who were adept at developing consensus decisions and had converted to Christianity were most likely to be selected. Although such tribal organization was relatively weak, the tribe used it as a basis for their team to file a land claim with the Indian Claims Commission, seeking compensation for lands taken by the federal government. In October 1948, the two livestock associations met with the Bureau of Indian Affairs superintendent to discuss pursuing a land claim against the U.S. Government through the newly formed Indian Claims Commission. They contacted Jacksonville attorney Roger J. Waybright, who initially was reluctant to take the case because the tribe had limited funding and the government dictated the amounts the attorneys could charge. Waybright was soon persuaded of the merits of the case and agreed to represent the tribe, signing a contract with his partner John O. Jackson on 15 October 1949. The 12 representatives who made the claim were the 6 trustees for the livestock associations and the 6 tribal representatives: Josie Billie, Jimmy Cypress, John Cypress, Junior Cypress, John Henry Gopher, Little Charlie Micco, Bill Osceola, Frank Shore, Jack Smith, Morgan Smith, Ben Tommie, and Sammy Tommie. The claim was filed 14 August 1950 and represented land taken under the Treaty of Moultrie Creek in 1823, land taken under the Treaty of Payne's Landing in 1832, land taken in the Macomb Treaty of 1839, and land taken in 1944 for the Everglades National Park —– in all totaling nearly $48,000,000. In July, 1951 the Seminole Nation of Oklahoma had also filed a petition before the Indian Claims Commission for claims involving their removal to Oklahoma and substantially the same land takings under Moultrie and Payne's Landing as the Florida Seminoles. Because of the overlapping of claims, the commission split the Florida claim into 2 cases, one sharing the Oklahoma claims in the treaties and the other, dealing with Florida's sole claim to land taken for the Everglades National Park. Government delays; tribal re-organization, which caused Waybright to resign from the case; resignation of the female replacement for Waybright, Effie Knowles, who felt the tribe would be happier with male representation; the hiring of Roy Struble of Miami and Charles Bragman of Washington, DC; and the death of attorney John Jackson all contributed to the claim dragging into the 1960s. Then in 1962, the Miccosukee Tribe of Indians of Florida organized their tribe and gained federal recognition. They sought to intervene in the case in 1968, but were not allowed. Finally on 13 May 1970, the Claims Commission awarded $12,262,780, which was promptly appealed by both the Oklahoma and Florida Seminoles. In 1975, in a compromise settlement to prevent further delays, the two groups agreed to $16,000,000 as a final settlement, but were required to have general meetings with their tribes to confirm the amount. In January 1976, the Florida Seminole were presented with the terms of settlement; it was translated into both the Mikasuki language and Muscogee language. Only seven tribemembers opposed accepting the agreement. In March 1976, the unorganized Traditionals in Florida filed an injunction to stop the award. On 11 March 1977 the Traditionals' complaint was dismissed. On 20 April 1977 the Macomb claim was disallowed, but an additional $50,000 was awarded for land in the Everglades. With those final decisions the awards were completed, but it took another fourteen years before the funds were distributed. The Claims Commission gave no direction as to how the judgment was to be split between the tribes of Oklahoma and Florida Seminoles, the Miccosukee and Traditionals. The groups had to negotiate as to how the settlement would be apportioned, leading to the most contact among them in a century. During this period, the money was put in trust and earning interest. In 1990, the groups finally agreed to the Seminole Nation of Oklahoma receiving three-quarters of the settlement, based on early population records from 1906 to 1914, when members had blood quantum; and the Florida Seminole in total to receive one-quarter, based on reconstructed early 20th-century censuses. At the time of the settlement, the two Florida tribes and Traditionals had a higher percentage of full-bloods due to their endogamous marriage practices. They also had blood quantum requirements for tribal membership. By 1990, the total value of the trust had reached $46 million. In 1953, the Seminole were informed they were on the congressional list for termination of their tribal status and federal benefits, under the federal Indian termination policy to reduce costs and the determination that some tribes no longer needed any special relationship with the federal government. But termination would result in their eviction from the three existing reservations. Few of the Seminole at the time had gained formal education or graduated from high school, and they worried about being able to organize as a tribe in order to deal with the government. The federal government persisted in classifying all the 918 Native Americans in the Florida agency area as Seminole, although the 305 Miccosukee and Traditionals closer to the Tamiami Trail did not identify with the reservation Seminole. They had asserted their independence from the reservation group since the 1920s. The Seminole appealed to have federal supervision continued so they could better prepare to manage their affairs. The superintendent of the Seminole Agency in Florida asked tribal leaders to elect representatives from the reservations to have people at hearings: Dania (now Hollywood) was represented by Sam Tommie and Laura Mae Osceola; Brighton by Billy Osceola and Toby Johns; Big Cypress by Josie Billie and Jimmie Cypress; and the Trail people by Henry Cypress and Curtis Osceola, as the founding representatives. Creek (Muscogee) and Mikasuki language interpreters were appointed. Although the Traditionals or Trail people wanted to continue with their Tribal Council, the Seminole continued to develop an alternative form of government. They went to Washington to testify to Congress, and solicited help from the women's groups who had formed to help the Seminole, such as The Friends of the Seminoles Florida Foundation, Inc., the Seminole Indian Association, Indian Welfare, and the Florida Federation of Women's Clubs. Their officers also testified for the Seminole. The women had developed organizations to aid the Seminole; for instance, they helped support children to go to boarding schools, lobbied to get Seminole admitted to local public schools, which were racially segregated and classified the Seminole as among "colored" to attend with African Americans; and loaned money to men trying to buy homes. The Seminole consulted with other tribes and experts to help them develop their government structure. They wrote a constitution and corporate charter, modeled on the Indian Reorganization Act of 1934. The vote was opened in 1957 to the 448 reservation Seminole and any Trail Indians who wanted to participate; the Seminole approved the constitution and corporate charter on August 21, 1957. The Seminole Tribe of Florida received federal recognition later that year. This process had heightened the differences among the groups. The Trail peoples, who were Mikasuki-language speakers, formed their own government, receiving state recognition in 1957 and federal recognition as the Miccosukee Tribe of Indians of Florida in 1962. Some Traditionals refused to affiliate with either tribe, as they wanted to avoid relations with the federal government. The Miccosukee had reservation land taken into trust for them by the federal government. In addition, the two tribes made a long-term lease arrangement in 1983 with the state of Florida for access and use of nearly 200,000 acres of wetlands. This access greatly expanded their ability to maintain traditional fishing and hunting practices. The Seminole Tribe of Florida is led by an elected tribal council comprising representatives from each of its reservations. It elects a chairman and vice-chairman as leaders. The tribal headquarters are located in Hollywood, Florida. In 1975 Howard Tommie was re-elected as chairman to a second term by a wide margin. He led the Tribe through 1979 in a number of important initiatives that created a new direction for the people, with assertion of sovereignty, significant revenue generation, and accelerated economic development. He urged acceptance of the US land claims settlement in 1976; the Florida and Oklahoma Seminole negotiated for more than a decade before reaching their final agreement in 1990 as to distribution of trust funds. He initiated negotiations with the state of Florida over water rights at the Seminole reservations, winning legal standing and protecting their resources. Learning from operations on the Colville reservation in Washington state, Tommie directed the establishment of a tax-free cigarette shop on the Hollywood Reservation, where the tribe started to generate more substantial income. Next they pursued a high-stakes bingo operation on their reservation, which also started to generate substantial revenues. Jim Billie, who was re-elected in 2011 with 58.4% of the council vote, after previously serving from 1979 to 2001, led the tribe through a dramatic expansion of operations, with development of new programs and facilities as it invested the revenues generated from gaming and related entertainment. The 1979 plan for high-stakes bingo survived court challenges, and the first major Indian gaming establishment in the United States was opened in 1981 by the Seminole. Subsequent changes in federal and state laws have paved the way for dozens of other tribes to increase their revenues through development of gambling casinos, resorts and related hotels and retails shops. All generate revenue as well for the states in which they are located, under compacts regulated by the Indian Gaming Regulatory Act of 1988. The Seminole tribe has six reservations. They have developed more extensive hotels and related resorts for gaming on some of their reservations. Since 2007, the Tribe has owned the Hard Rock Cafe franchise, and established it in their hotels and casinos. They now have a total of seven casinos. Tourism, both as related to the casinos and in terms of attracting people to the reservations for hunting, fishing, and guided tours, is also a part of their economy. Other significant parts of their economy are based on production of the citrus groves and cattle farming on the Brighton and Big Cypress reservations, and forestry. Beginning with a small group of cattle brought from the West in the 1930s, the Seminole Tribe has developed the 12th-largest cattle operation in the country. It is located primarily on the Big Cypress and Brighton reservations. In a related development, since 2008 the Seminole Tribe has marketed its beef under the brand, Seminole Beef. They are featuring it in their Hard Rock Cafe and hotels, and intend to market it to other Indian tribes, military installations, restaurants and supermarkets throughout the country. According to a tribal audit, in 2005 the tribe took in $1.1 billion in revenue. They pay a dividend to tribal members on a monthly basis from a portion of the income to the tribe. In February 2012, the Tampa Bay Times reported that the Seminole Tribe employed a total of 12,000 people at its headquarters and six casino operations. In the early part of the 20th century, the Seminole were still mostly full bloods and had prohibitions against members going outside the tribe for marriage partners. In a 1999 interview, Betty Mae Tiger Jumper, chairwoman of the Tribe from 1967 to 1971, said that in the late 1920s, Seminole medicine men had threatened to kill her and her brother, then young children, because they were half-breeds with a white father. She learned that other half-breeds had been killed. Her great uncle moved her family to the Dania reservation for safety. Similarly, former chairman Jim Billie, who also had a white father, recounted that, as an infant, he was threatened in 1944 by tribal men because he was a half-breed; his mother and Betty Mae Tiger, then a young woman, saved his life. The tribe has since become more open to intermarriage. It also permits non-tribal spouses (including white or black) to live on the reservations, unlike in earlier times. It requires tribal members to have a documented blood quantum of at least one-quarter Seminole ancestry. As of 2000 there were around 2,000 enrolled members in the tribe, with over 1,300 living on the reservations. The Tribe includes some Black Seminoles, including 50 living on Fort Pierce Reservation. Fort Pierce Reservation, a 50 acres (0.20 km2) site in St. Lucie County, taken into trust for the tribe in 1995 by the U.S. Department of Interior. The tribe has constructed a modern housing development, known as Chupco's Landing, and a community center for members. Additionally, the tribe has purchased a 796-acre (322 ha) tract of land at the edge of the Green Swamp north of Lakeland, Florida, known as the Lakeland Trust Lands, which it intends to turn into a 151-home tribal residential development with facilities for residents' social, cultural, and educational needs. Bidding to construct the first phase of the development ended in October 2018. Most members of the Tribe are bilingual, speaking the Mikasuki language (which is also spoken by the Miccosukee Tribe) and English. In the 1970s, all the members of Big Cypress Reservation still spoke Mikasuki, and most of the Seminole spoke it. The Creek language is spoken by some Florida Seminole, especially those living on Brighton Reservation. Use of both Muskogean languages has declined among younger people. The Seminole continue to observe traditional practices such as the Green Corn Dance. They have two ceremonial grounds within the boundaries of the Big Cypress National Preserve. In addition, they have created some new celebrations: the Big Shootout at Big Cypress, celebrated since 1997. A few years ago, they added an historical re-enactment to the annual Big Shootout, in which re-enactors take the part of Seminole, Black Seminole and US forces. In 1956, Betty Mae Tiger Jumper (later to be elected as Chairwoman of the tribe) and Alice Osceola established the first tribal newspaper, the Seminole News, which sold for 10 cents a copy. It was dropped after a while, but in 1972 the Alligator Times was established. In 1982 it was renamed the Seminole Tribune, as it continues today. Betty Mae Tiger Jumper became the editor-in-chief; as the tribal storyteller, she contributed traditional stories and articles about Seminole culture. In 1989, the monthly Seminole Tribune was the first Native American newspaper to win a Robert F. Kennedy Journalism Award. That year, it was also nominated for a Pulitzer Prize. A member of the Native American Journalists Association, in 1997 it earned five awards from that organization. Florida State University in Tallahassee uses the Seminole name and imagery for its athletics programs, the Florida State Seminoles. The name was adopted in 1947 after a fan vote; reportedly the new college football team preferred it so much that they stuffed the ballot box in its favor. Since 1978, a student portraying Osceola has been the official mascot at football games; previously more cartoonish Indian-themed mascots were used. In the 1980s and 1990s, when mascots based on Native Americans became more controversial and many Native Americans and supporters protested their use, Florida State consulted with the Seminole Tribe of Florida, emphasizing that their use of the names and the Osceola mascot were not intended to be demeaning. Several representatives of the Seminole Tribe, including Chairman James E. Billie and Council Member Max Osceola, have given FSU their blessing to use Osceola and Seminole imagery. However, the matter remains controversial for other Florida Seminoles, as well as members of the Seminole Tribe of Oklahoma. In 2005, FSU was among the schools potentially facing NCAA sanctions for using "hostile and abusive" Indian mascots and names; after much deliberation, the NCAA gave FSU an exemption, citing the university's relationship with the Seminole Tribe of Florida as a major factor. Ironically, in 2016 the Seminole-owned Hard Rock Cafe purchased the naming rights to Sun Life Stadium in suburban Miami, home to one of Florida State's two great rivals, the Miami Hurricanes. 1957–1966: Billy Osceola, inaugural holder. 1967–1971: Betty Mae Tiger Jumper, first and only chairwoman of the tribe, editor-in-chief of the Seminole Tribune, tribal communications director, and the last matriarch of the Snake clan. Jumper spoke English, Mikasuki, and Muskogee. 1971–1979: Howard Tommie, political leader and two-term chairman of Seminole Tribal Council who initiated programs in the 1970s, including accepting the U.S. land claim settlement; successfully negotiated with the State of Florida for water rights for the Seminole reservations, and establishment of tax-free smoke shops and high-stakes bingo as revenue generators. Tommie speaks English, Mikasuki, and Muskogee. 1979–2003: Jim Billie, suspended in 2001, officially removed in 2003. Billie chaired during an expansion of Indian gaming and increase in tribal wealth and economic development. 2011–2016: Jim Billie, re-elected and again removed by Seminole Tribal Council in a unanimous vote (4–0) on account of "various issues with policies and procedures of the Chairman's office." Abiaka, "medicine chief" and war chief of the Miccosukee during the Seminole Wars who successfully defied attempts by the Jackson administration to extract native tribes from the Southeastern United States to present-day Oklahoma. Louise Gopher, first Seminole Tribe of Florida college graduate. Betty Mae Tiger Jumper, first female chief. Micanopy, principal chief from 1825, through the Second Seminole War, until his death in 1849 in Indian Territory. Desoto Tiger, trapper, first Seminole murder victim whose white killer was convicted of murder, although no time was served. ^ a b Pritzker, p. 389. ^ a b c Mahon, pp. 203–204. ^ a b c d e f g h Covington, James W. (1980). "Seminole Leadership: Changing Substance, 1858–1958" (PDF). University of Tampa. pp. 32–34. Retrieved January 15, 2015. ^ "History & Culture". National Park Service. Retrieved January 15, 2015. ^ "Royal Palm State Park". National Park Service. Retrieved January 15, 2015. ^ Jensen, Bob (May 3, 2012). "CCC's work in 1933 Homestead forged the trails for Everglades National Park". South Dade New Leader. Retrieved January 15, 2015. ^ Second-Jumper, Sigfried R. (2011). Second Jumper: Searching for His Bloodline. [S.l. ]: Lulu Com. pp. 108–109. ISBN 978-1-4357-9099-5. Retrieved January 15, 2015. ^ a b c d Kersey Jr., Harry A. (July 1993). "The Florida Seminole Land Claims Case, 1950–1990". The Florida Historical Quarterly. Florida Historical Society. 72 (1): 35–55. JSTOR 30148665. ^ a b "Seminole Tribe of Florida Reservations". www.semtribe.com. Seminole Tribe of Florida. 2013. Retrieved April 16, 2013. ^ "Betty Mae Jumper interview". Seminole Oral History Collection, Samuel Proctor Oral History Program. University of Florida Digital Collections. June 28, 1999. p. 4. ^ a b Mike Clary (November 26, 2007). "On Fort Pierce Reservation, black Seminoles complain of isolation". South Florida Sun-Sentinel. Archived from the original on May 26, 2013. Retrieved April 15, 2013. ^ Palmer, Tom (February 13, 2011). "Seminoles Pursue New Reservation in Polk". The Ledger. Lakeland, Florida. Retrieved October 18, 2018. ^ "Seminole Tribe of Florida Request for Proposals: RFP 99-2018 Infrastructure Development Phase I, Lakeland Trust Lands" (PDF). Seminole Tribe of Florida. Retrieved October 18, 2018. ^ "About Alligator times. (Hollywood, Fla.) 1972–1983". Chronicling America: Historical American Newspapers. Library of Congress. Retrieved January 27, 2014. ^ King, C. Richard; Charles Fruehling (2001). Team Spirits: The Native American Mascots Controversy. University of Nebraska Press. p. 136. ISBN 978-0803277984. Retrieved April 18, 2013. ^ King, C. Richard; Charles Fruehling (2001). Team Spirits: The Native American Mascots Controversy. University of Nebraska Press. p. 142. ISBN 978-0803277984. Retrieved April 18, 2013. ^ King, C. Richard; Charles Fruehling Springwood (2001). Team Spirits: The Native American Mascots Controversy. University of Nebraska Press. pp. 143–145. ISBN 978-0803277984. Retrieved April 18, 2013. ^ a b Steve Wieberg (August 23, 2005). "NCAA allowing Florida State to use its Seminole mascot". USA Today. Retrieved March 1, 2013. ^ King, C. Richard; Charles Fruehling Springwood (2001). Team Spirits: The Native American Mascots Controversy. University of Nebraska Press. pp. 145–147. ISBN 978-0803277984. Retrieved April 18, 2013. ^ Rosier, Paul C. (2003). Native American Issues (Contemporary American Ethnic Issues). Greenwood. p. 14. ISBN 978-0313320026. Retrieved April 18, 2013. ^ "Florida State Can Keep Its Seminoles". The New York Times. August 24, 2005. Retrieved April 18, 2013. ^ Kersey, Harry A. (1996). An assumption of sovereignty : social and political transformation among the Florida Seminoles, 1953–1979. Lincoln [u.a. ]: Univ. of Nebraska Press. pp. 118–119. ISBN 978-0-8032-2728-6. ^ "Seminole Timeline". Retrieved January 14, 2015. ^ Testerman, Jeff (March 19, 2003). "Seminoles sack chairman James Billie". St. Petersburg Times On Line. Retrieved January 14, 2015. ^ "James Billie Once Again Chairman Of Seminole Tribe". CBS Local Media. Associated Press. May 11, 2011. Retrieved January 14, 2015. ^ Sweeney, Dan. "Seminole Tribe elects new chairman". Sun-Sentinel.com. Retrieved March 5, 2017. Clary, Mile (May 10, 2011). "Once ousted, James Billie returns to lead Seminole Tribe". South Florida Sun-Sentinel. Retrieved October 3, 2011. Gallagher, Peter B. (October 2004). "The Rise and Fall of Chief Jim Billie". Gulfshore Life. Retrieved October 3, 2011. Garbarino, Merwyn S. (1972). Big Cypress: A Changing Seminole Community, New York: Holt, Rinehart & Winston. Garbarino, Merwyn S. (1988). The Seminole, New York: Chelsea House.